Richmond, CA- DiCon Lighting, a leading designer and manufacturer of high brightness LED lighting devices is proud to announce the launch of an exciting new brand, Fiilex. Its mission is to bring innovative light fixtures into the Image Capture Industry using DiCon's proprietary Dense Matrix LED platform. The advancement in digital camera equipment, the rapid growth in video production, and the maturity in solid-state lighting technology, has set the stage for LEDs to be the primary continuous lighting source for photographers and videographers. In the past few years, the industry has seen a massive influx of LED products. The majority of these devices use the traditional individually packaged LEDs to form either large lighting panels, which require heavy diffusion for smooth mixing of light, or "pseudo-spotlights" through the use of bulky and inefficient secondary optics. Recognizing that the market demands a better lighting source, Fiilex assembled a team of experts to identify the needs and conceptualize designs that will exceed industry expectations. With the use of our Dense Matrix LED technology, Fiilex brings to the market innovative LED light fixtures that are not just compact and beautifully designed, but also intelligent with tunable color spectrums. These lights are super lightweight, extremely portable, and generate a brilliant quality of light. Emitting from an area that is smaller than a dime, these fixtures set themselves apart from conventional LED products and by defining an all-new class of true specular LED sources. "Our goal is not to just introduce another LED product," says Brent Siebenaler, Brand Manager for Fiilex, "but to present the best that LED technology can offer to the image capture industry." At the approximate size of a coffee mug, P360 is an engineering triumph of LED technology. This cylindrically shaped light measures exactly 4 inches in diameter, is less than 5 inches in length, and weighs less than 2 pounds, for outstanding portability. Inside the outer housing, resides a complex system that incorporates a 90W 56-chip 8-channel DiCon Dense Matrix LED as its light engine, with a highly efficient active vapor-cooling module as the thermal foundation. The P360 incorporates an advanced yet easy-to-use intelligent electronic control system that can continuously tune the color spectrum from tungsten to daylight. The greatest advantage of applying the Dense Matrix LED platform to the P360 is the creation of a true specular LED light source that can be manipulated effortlessly with compact light modifiers. 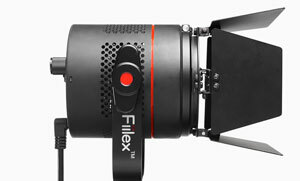 At launch time, Fiilex will make available a list of accessories to work with the light. 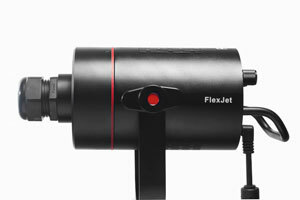 The first items to be released include a 4-leaf barn door that can be installed and manipulated with just one hand, a 2" fresnel lens, a magnetically attached gel holder, a dome-shaped light diffuser, an umbrella holder, and a travel softbox to conveniently spread a specular LED light into an evenly diffused source. The compact size also allows P360 to work with a variety of standard or proprietary light shaping devices in the market, allowing buyers to continue the use of previously purchased equipment. "As a vertically integrated company that designs, manufactures, and markets products that range from individual LED chips and arrays to complete lighting fixtures,"" says Robert Schleicher, Vice President of Product Development, "we can seamlessly integrateall of the necessary elements in the chain, to effectively design and produce a one-of-a-kind light fixture for our targeted users." With the ability to accept 12 to 28 Vdc input for use with many industry standard batteries, the flexibility to adjust light spectrums to match the lighting on a set, and the reliability of Dense Matrix LED for long lasting usage, the P360 is expected to become the day-to-day work horse for lighting experts in the motion picture, broadcast TV, video production, and professional photography fields. The P200 FlexJet is another technical and design marvel from the Fiilex product development team. At the center of an all-metal housing is a uniquely configured 60W Dense Matrix LED core. Cooled with an advanced liquid-infused thermal component, this illuminator projects a significant amount of light from a coin-sized opening. Coupled with a variety of side-emitting and end-emitting light guides, P200 allows users to manipulate the light with ease for creation of extraordinary effects. Beyond tweaking light distribution through fiber-optics, smart electronics let users freely change color settings with a simple click on the dial. Fiilex engineering team defined 8 stunning color spectrums: 3200K Tungsten, 4500K Metal Halide, 5600K Daylight, Magenta, Yellow, Aqua, Cyan, and Blue. These presets provide opportunity for pros to play with the colors and set the moods. The name FlexJet represents two key features of this product: a "Jet Stream" of light that comes out of the tiny Dense Matrix LED, and the creatively arranged mechanical structure that includes "Flexible" swapping parts. The standard P200 comes with a detachable front cap that is designed to fit a basic fiber adaptor. Fiilex is also planning to release a list of other caps that can be used to shape the light. As the product grows in acceptance, Fiilex will have opportunity to incorporate feedback from industry experts for the design of other novel light modifiers. "P200 is a statement," said Brian Chiang, Vice President of Marketing. "We are releasing this product to both showcase the strength of the Dense Matrix LED platform and to give a sense of where we plan to take this technology in the future." Using the proprietary Dense Matrix LED platform, and a broad range of technical expertise in material science, optics, thermal system, electronics, and product design, DiCon Lighting creates and manufactures a variety of innovative LED luminaries for architecture, entertainment, horticutlure, aquaruim, image capture, and bio/med industries. Operated under the parent company DiCon Fiberoptics, Inc., it has 27 years of proud recognition and excellence in the photonic industry.